Vertical Challenge is a Professional Brisbane Window Cleaning and External Facade Maintenance company with over 25 years experience in the height access industry. We offer the complete range of window cleaning solutions ranging from Executive Homes, Office Blocks (High and Low Rise), Factories, Airports, Clubs, Military Bases, Schools and Universities. Vertical Challenge manages sites requiring a team of cleaners or just one individual. No matter how frequently you need your windows cleaned we always deliver the highest standard of workmanship, ensuring quality results. We hold broad experience in the full range of Window Cleaning and height related Access Methods. We presently enjoy the support of over 100 regular commercial clients providing specialist height services to Aiports, QANTAS, Westfield, Transfield, Serko Sodexho and Honeywell. 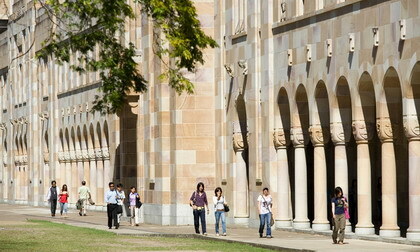 Window Cleaning contract to University of Queensland 120 buildings, twice a year for 10 years. Initial External Window Clean to Waterfront Place. 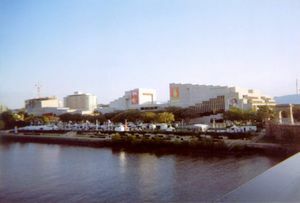 Strong and fluctuating winds from the Brisbane River curling around the building, often closed us down - on a project with strict deadlines. The 'Eloquent Solution'? Spotlights were placed on the swinging stages and a 24 hour crew was billeted on site, ready to spring into action when the wind lulled - this usually occurred around 4 am in the morning. To house our intrepid window cleaners bedbunks and coffee making facilities were installed in the building basement. 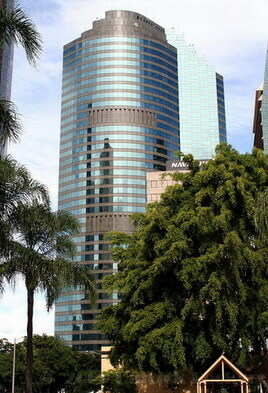 Vertical Challenge has performed the window cleaning to most of the State Government buildings in the Brisbane CBD including the State Government Executive Building and Education House. Education House is a 24 story high rise which was pressure cleaned after erecting roof scaffolding for the swinging stage.